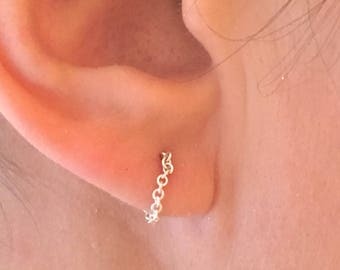 These earrings are very simple and great to wear for everyday. 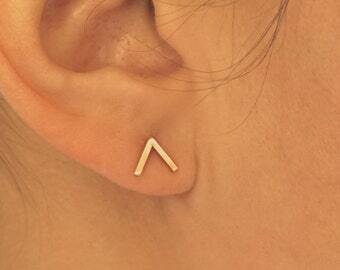 The whole earrings is made out of sterling silver or 14k yellow gold. 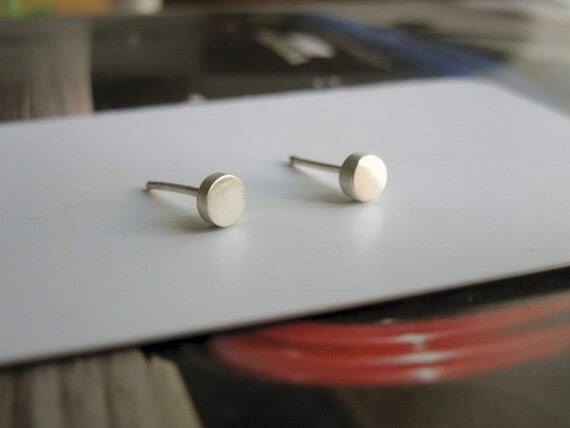 Earring backs and ear nuts are also solid sterling silver or 14k gold. 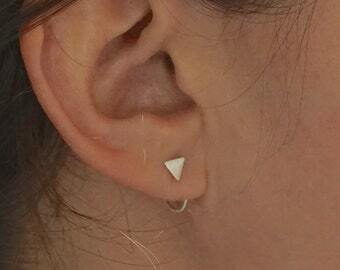 The earrings have a matte finish to them. They are great for all ages! Not your usual flat disks, more sculptural. They stand out even though they're small. The packaging is also out of the ordinary. You can see the shop owner pays attention to everything. Lovely! Exactly as pictured, quick delivery. These were a gift for my niece. She’s loves them and the quality is fantastic. Paypal, Credit & or Debit Cards, and Gift Cards are accepted here at Virginia Wynne Designs during checkout. Please note that payment must be made immediately when purchasing by clicking on the ‘Pay Now’ button. Please email with ANY concerns or questions, PRIOR to leaving feedback here on Etsy, so that I can have an opportunity to assist you and correct any issues/mistakes. Exchanges are available on rings and bracelets in order to correct the fit on the same item. (Please note, I will only exchange for fit one time.) There are no refunds on bracelets or rings. There are NO refunds on any items unless it is the seller's fault. I.E. refunds will not be given for skin reacting with metals, metal tarnishing, or color of metals not what buyer thought it would be, loss of earrings, etc. No Refunds or exchanges will be given on items mailed back without prior knowledge of the Seller and Buyer. Items will not be refunded unless agreed upon beforehand and. Items will not be refunded if sent back to Seller without knowledge. I do not accept returns on any custom orders. I am not responsible for items that are damaged or lost in the mail. If your order is damaged in the mail please take photos to document all damages. Contact me right away if you would like me to remake or exchange the piece. I ship all of my packages through USPS with complimentary delivery confirmation. When the status of the sent package is changed to "Delivered", it is no longer my responsibility. There is no refund on shipping/handling charges. The buyer is responsible for all shipping costs associated exchanges. This means that the Buyer is responsible for the shipping costs to the Seller for an exchange and the Buyer is also responsible for the shipping of newly exchanged items back to them (Buyer). No returns/refunds are to be given on items returned on international orders due to Buyer not claiming package, paying additional import duty, taxes, and/or customs charges and fees. Buyer is responsible for charges on reshipment of item. Exchanges are accepted within 7 days of the item being shown as received according to the delivery confirmation. The item must be in ORIGINAL PACKAGING and UNUSED / UNWORN. Exchanges can only be on item(s) that are equal of the original purchase. Buyer can exchange for item(s) of greater value but must pay the difference in price. The exchange will be issued upon return of the item, less shipping. The buyer is responsible for return postage. If an exchange is requested, the buyer is responsible for the postage. When shipping an item back, please make sure the earrings are not just put in an envelope because they will get damaged, squished, and potentially be forced out of the package due to the automated machines used for shipping. If they are not properly packaged and do get damaged, Buyer may be liable for associated charges, such as ear back replacement. On an exchange of an item, please add a note in the box and provide a tracking number so I know when to expect your package. Custom work is not eligible for a refund or exchange - all custom work sales are finial. Most orders ship within 3 to 5 business days after your order is placed. THIS DOES NOT INCLUDE WEEKENDS or FEDERAL HOLIDAYS. Items that take longer to ship with a transit time of about 2 to 5 days. If you need your order by a specific date, please let me know and I will do my best to try to accommodate your request. I use the address provided when Buyer is checking out on Etsy. Please make sure you let us know if you would like us to ship to another address. I cannot be responsible for buyers' errors, e.g. if your item is shipped to your previous Paypal address or other invalid address on file in your Paypal account. Please make sure your preferred address is up-to-date. Thanks! Seller is not responsible for lost or stolen items but will do everything possible to accommodate the buyer. The shipping cost does not include insurance or signature confirmation (US Domestic orders only) but can be selected during shipping type for an additional fee. Buyer is responsible for selecting options if wanted. All orders are shipped USPS First Class. Transit time is about 2-5 days. This does NOT include production time. If you would like expedited shipping (Priority, Overnight, etc), please let me know and I will change your invoice.US orders include delivery confirmation (tracking). International orders do not include delivery confirmation, do to the carrier. To arrange other shipping options, please message me. For international orders, Virginia Wynne's Designs does not cover customs fees and will not mark any orders as a gift. International shipments may be subject to import duties and taxes levied once the shipment reaches your country. Additional charges for customs clearance are the responsibility of the recipient; we do not control these charges and cannot predict what they may be. Please contact your local customs office for more information. Occasionally packages can be substantially delayed, up to 45 days, but the usual transit time is 7-14 days. No refunds are given for items that were shipped out on or before the correct ship date that have unusually slow transit times. All items that are shipped out and that have been returned to sender (wrong address, did not pick up from the post office, etc.) Buyer will be responsible for the purchase of another label for the item to be resent out and is not subject to a return/refund/exchange. As all items are handmade, the item in the photograph may vary slightly from the item you receive. Any earrings photographed on models were sample items - the items you receive have not been worn! All items in pictures are examples of what the item will look like. 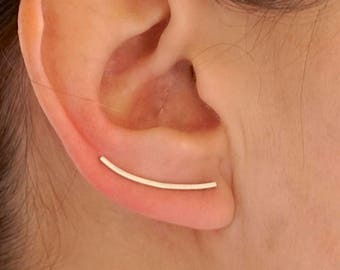 There is no guarantee that the item will look exactly as pictured as everyone's ear shape and piercing location is different. If you are concerned about how an item may fit or look while being worn, please feel free to contact me so we can possibly discuss options. 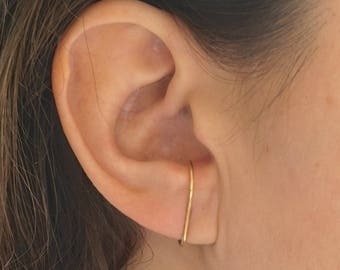 If you lose a match to your earrings I will be happy to replace the lost earring. Contact me and I will set up a custom link for you in my shop. I will charge half of the price of the full pair plus shipping. I am NOT responsible for the lost of a earring(s). I do not except packages that are return with out notifiying me for exchanges. I welcome custom requests and would love to work with you on your ideas, just send me a message. Jewelry will tarnish over time. It is up to the Buyer to understand the materials and metals that they are purchasing and understand the maintenance that may be required to keep the pieces bright and shiny. To keep it looking its best use an appropriate jewelry cleaner for the piece. Be careful with certain stones and pearls so not to damage them. What Color are the different types of Metals that are used in your Shop?